Safety tips for parents and students. Follow these tips to stay safe and grounded. Let us know if you have any concerns. Be at the bus stop early. Arrive 5 mins prior to the bus stop time. Wait for the bus in a safe place away from the road. Never horse around at the bus stop while the bus is arriving to the stop. Stay on the side of the road, away from traffic, until the bus stops and the drive signals you to cross. When the driver signals that it is safe to cross, you should check for traffic first. 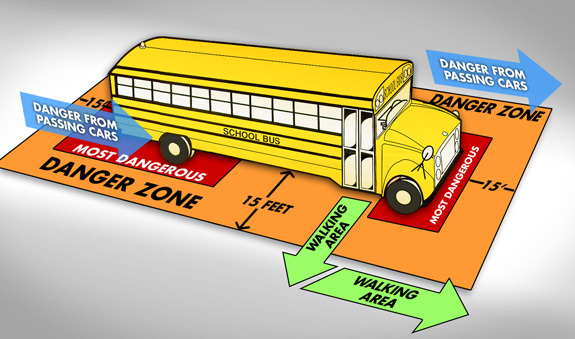 Move toward the rear of the bus quickly without crowding or pushing. Sit down, and stay seated. Listen to the driver and follow their directions at all times. Always keep your head, hands, and feet inside the bus. Do not damage the bus or equipment. Stay seated until the bus stops. Do not push or crowd as you exit the bus. Stay on the side of the road away from traffic and ten feet in front of the bus where you can see the driver's face. Never run back to the bus for anything you left behind or dropped. Skis, cleats, roller or ice skates, skateboards, snowboards, skooters, etc.